I have a lot of zucchini love this week. I missed last weeks post on zucchini love so I have a few dishes this week which make the zucchini the hero of the dish. But first I am finally down to just one zucchini plant. The first one I broke which was very sad as I had a brilliant supply from that plant. This week I had to pull another plant out as it was rotting away because it was being smothered by 3 pumpkins and another zucchini (yes they were planted far to close together). So I am down to 1 which I hope will still provide the family. Next up were some roasted courgettes. I sprinkled cayenne pepper, seasoned and topped off with mozzarella. Threw them in the oven for about 20min @ 180 C. They were a nice accompaniment to dinner. And finally Italian agrodolce zucchini with mint and chilli by Belinda Jefferies. These were really nice but I do find raw garlic a little overpowering so I think next time I will use less. * Slice 1kg zucchini into thin lengths. Bbq them or chargrill them to get some colour on them. * Stir the zucchini through the vinegar mix and leave to soak in for 5 mins. Pretty tasty and a great addition with the mint. Hooray I found a new cord and even managed to get other fancy bits and pieces that can upload onto the I-pad. And am now trying to manage this through the blogger app. I expect all you very clever people out there might be clever enough to have sorted this all out. But I figure I spend time working in the garden and a lot less time on computers.... Let me know if you use the app and if you find it easier or a hinderance. 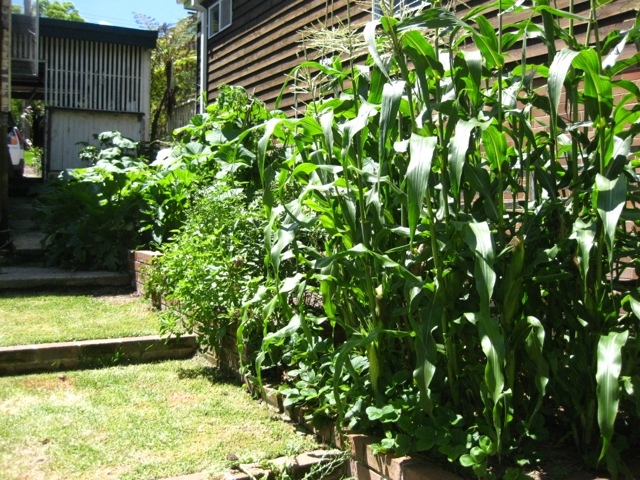 Anyhow despite a range of blogs I had hope to talk about last week I thought I would discuss my corn instead. Doesn't it look lovely? Well the rats, aphids and ants thought so. So in a bed 1700 x 2000 mm I managed to get 7, yes 7 cobs to take inside. 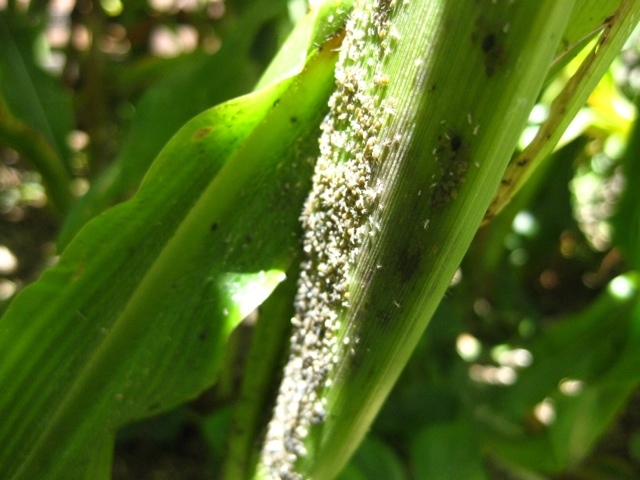 The rats ate about 60% of the crop while the aphids attacked the rest. 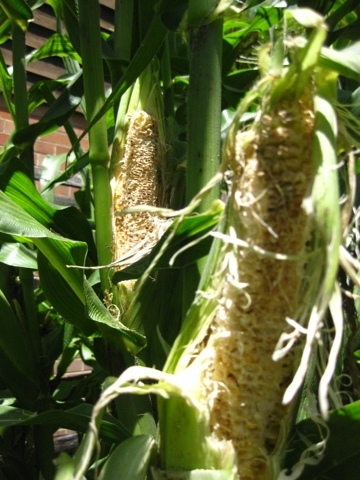 I have stripped the corn the rats started with and plan on giving them to the neighbours chickens who I am happy to let eat. I can only hope the rats starve now (wishful thinking). I do hope your corn is doing a thousand times better than my patch at the moment. A least I now have a new patch to plant up in which is greatly exciting as I have much to add that might be pest unfriendly. Well I have a sad confession to make this week. I killed my best zucchini supplier. I didn't mean to it just happened to be hoovering over the lawn and didn't cope very well when I gently moved it aside. Now I really don't think I was that rough despite my mothers words 'you are a like a bull in a china shop'. In fact I thought at first it was those rats. But then I remembered that in my haste to get the lawn mowed I picked up the offending overhanging branches up off the grass and it would seem I snapped it. There was not much left to save once the growing and fruit part had no roots left. So I now have a gap. Not a very big one especially once the pumpkin takes hold. Thankfully I did many a small harvest or two yesterday. Gosh isn't rain a gorgeous thing after such a long dry? Rain helps re-charge the garden and the gardener. It clears out the cobwebs. You can almost hear the garden sigh with appreciation. Hope the weather is kind to you wherever you are.